When the girls were small, I took great pains to make certain that I dressed them in clothes suitable for public outings. Everything was clean, color coordinated, and I would say pressed, but we all know that I won’t go within 20 feet of an iron. I felt like my childrens appearance was a direct reflection on my parenting skills. One fateful day, Fiddledaddy proclaimed to a 4 year old Cailey, “Go ahead and pick out your own clothes today.” I could be heard in the background, “NOOOOOOOO!” And from that day forward, I have tried to steer my daughters in a direction that did not include orange floral capris, with pink striped t-shirts. And it has mostly been a losing battle. By the time Jensen came along, I had long since given up the idea that the appearance of a well put together ensemble, meant that I was a stellar mother. Because at that point, with one look at me, and any observant passer-byer could only shake their head in sympathetic shame. And with that, he retreated back into his room. Some time later, from the groans I could hear from the sisters, he had formulated an outfit. He came down the hall wearing black sweat pants, with blue shorts, green t-shirt, black hooded jacket, with his customary red baseball cap on top of the hood of the jacket. Oh yes, and red Crocs. With white socks. Frankly, I didn’t care, since Fiddledaddy was taking all the children on an outing, while I remained blissfully at home. No reflection on my parenting prowess, whatsoever. Imagine Jensen’s delight when he found this item of clothing wrapped under the tree. He had modeled it in Wal Mart, and Fiddledaddy managed to sneak it into the cart and purchase it right under Jensen’s astute nose. Christmas day was spent with Fiddledaddy’s family. Jensen dressed himself in his Mario bathing trunks, and Mario Brothers t-shirt. At least he matched. No one batted an eye when he breezed through the door. As I traverse this parenting journey, I am learning to pick my battles. Flip flops when it’s 23 degrees? Not a chance. Short shorts on the 11 year old? Cold day in h***. Pink floral capris with a red striped sweatshirt? A fashion risk, but acceptable. At what age (theirs, not yours) did you all just give up and let them make their own fashion choices? My kids insisted on picking out their own clothes, for the most part, at a very young age–one was 2 1/2, the other was 3. I did buy my son only solid color sweat pants, sweatshirts and t-shirts and I was fairly safe with that. My daughter would only wear dresses for a few years, but she also had good taste at a young age (better than me). After wasting a lot of money and pants, shorts or leggings that never got worn, I just bought her very heavy tights for the Chicago winters. By the time she was 6, I couldn’t get her in a dress. There was the time my son insisted on wearing shorts in the winter. I knew not to battle with this kid, and I knew it was not dangerous (we were only in the car and we had blankets), but I told him he could not tell me that he was cold or complain. He tried to complain a few times, but I stopped him in his tracks. After that we never had that problem again and he dressed for the weather. He still wears only solids. And he is 21 yrs old. My kids always chose as far as I remember. We chose what we bought them to wear and often it was things passed on to us by other (richer) family with slightly older kids anyway. There is a picture in the album of my son in the garden in his sun hat ,swimming trunks and wellington boots. My daughter in a pink snow suit on our summer holiday too. She loved that suit because it had little white pandas all over it. At 3 for both of them. It was at that time I felt that they were capable of putting the clothing on, and they didn’t like putting on clothes that I picked out. If I wanted to keep picking out the clothes I had to physically put it on them. Like you said, you pick your battles. I don’t buy anything I wouldn’t want them wearing, and I only keep seasonal clothing available, so I know that what they pick out is at least seasonally appropriate. Beyond that, oh well. My 8 year old daughter has picked out her clothes since she was 5. I gently guide her so she knows what coordinates. For a while she refused to wear pants and just wanted to wear skirts or skorts…fine by me. She has never worn a pair of jeans in her life, she said they hurt her tummy and she needs “soft pants only.” The only thing that drives me crazy is that she wants to wear her blue/pink crocs with everything, including dresses (even our fancy Xmas photos). I usually compromise by asking her to wear the dress shoes and I tote the Crocs with us so she can change into them later. Heck, her closet has twice as many clothes as mine. Our school has uniform, so they have NO choice on a day to day basis. The rest of the time if we’re not going anywhere “nice” I let them pick. And I think they have ever since they were old enough to reach all the drawers in their dressers. Kids clothes are supposed to match?? I must have missed that memo. Just kidding. When my daughter was small, I worried a lot about matching clothes. When she hit 3, she developed a taste of her own. It was good, but certainly not the same as mine. She is now 11 and asks if something matches if she has doubt about it. However, my son, who is 8, still wants to wear navy and black together. (shudder….) However, we are careful to buy pants and shirts that coordinate so usually there isn’t a problem. If you knew how fashioned challenged I was/am, you’d realize what a gift it was to my children when I let them pick out their own clothes when they started school. I am, however, an “ironer”, so I would take their daily choices and press them. Because pleats are camo to unmatched choices, right? As a mom to five children, I gave up on making sure their clothes matched awhile ago! I figure if *I* have matching clothes on, we are in good shape. My son has had a strong opinion about what he is going wear since about 18 months. He would put back whatever clothes I got out if he didn’t like/want to wear them. I just make sure everything co-ordinates (easy with boys) and that it is weather appropriate. Charlie now asks me “long sleeve or short sleeve? Pants or shorts?” before getting dressed. At two my oldest daughter head strong and all would choose to only wear ONE outfit a cute pink jumper. She would get it out of the dirty clothes, try and sleep in it so it would not become “lost”. It was a battle trying to “hide” the jumper so that she would wear something else. Now this 22 year old woman just birthed her little head strong girl 4 days ago. So I know the cycle will repeat and I can and will enjoy taking that little one to Walmart in her plastic heals and tiara and I won’t even bat a eye this time around. Probably around 6 or 7 years old (my memory is not what it used to be.) I have girls after all, and they have their own sense of style. My youngest at 5 was a princess (Disney of course) in every sense of the word. EVERYTHING in her life was pink or purple. At the age of 6, someone switched a flip, and she declared “princesses are for babies” and refused to wear pink ever again. To this day pink can only be a secondary color in ANY piece of clothing she owns. As in a tiny thread line of pink in the slippers I was going to buy her is ok, but more than that? Never. As for the other two…my 14 year old asked for a top hat for Christmas. A top hat?!? Not sure what she wants to do with it. I shudder to think what her peers at our public high school would do to her if she showed up wearing a silk top hat. My 16 year old likes to wear hunting themed hoodies despite never having hunted (or even held a gun) in her life. Whatever. They are clothed and MODESTLY, so I don’t make a big deal out of it. We give our 4-year-old a choice of two outfits each morning for school, but on the weekend all bets are off. He usually does pretty well. But last Easter he wanted to wear his pajamas and a winter hat ALL day…even to church. I drew the line there, and after having a holy fit he gave in. I agree with you about picking your battles. It took me a little while to figure that out. Well, I think it depends on the child. My older two didn’t have clothing preferences until 4 or so. My third born has more than made up for it. She is deathly attached to her pink cupcake jammies, and other various out of season clothing items. I never have had a problem with wearing “inappropriate” clothing out though. 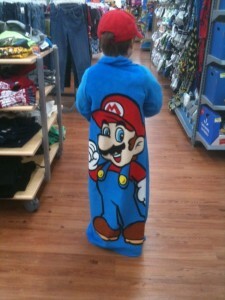 Jammies/or dress-up clothes to the store just weren’t an option. We did go through a long “uncomfortable underwear issue” and we have since moved on to socks. My son hates jeans and wants to only wear exercise pants, the silkier the better. I have made certain clothing categories. Sunday clothes( dressy), Wednesday church clothes( semi- dressy) and play clothes. I could care less what combo of play clothes they end up with. Depending on the circumstance I’ll tell them what category to dress in. Sometimes it’s “nice play clothes” (no stains and matching) Sometimes they simply don’t get to choose, I do. They rarely have a problem with this, well except the third born. I gave up early. I had twins that right off the bat color coded themselves that is still going on. No wild prints are allowed in their opinion and since their little brother gets all the hand me downs – he doesn’t clash either. He tried a few times but older brothers demanded that he change. LOL!!! This was the subject of discussion with my sons today. They are 18 months apart and I was OCD about their clothes when they were little … okay, even after they were “little.” Not only did their own clothes have to match (including their little socks matching their t-shirts), but they had to match EACH OTHER. They were ADORABLE, but they look in the family scrapbooks now and groan. They attended a Christian school with a dress code during elementary school, so they “matched” even then. It didn’t stop until they moved to public school in 6th and 8th grade … and even then they had the same band t-shirts, band jackets and youth group activity t-shirts (mission trips, camps, etc). They went through a stage when they couldn’t stand to be in a clothes store, which coincided with being very picky about what they wore so we (Grandma and me … their past providers of the wardrobe) couldn’t pick things out and bring them home. So jeans and the above referenced t-shirts were standard apparal. Now, at 17 and 18, their fashion sense is back and they are MORE than happy to have Mom and Grandma go on shopping trips and outfit them again with supplements to their wardrobes … with THEIR choices, of course! This post and the comments make me laugh so hard! My 6-yo son wore his new shark bathrobe around the mall after I bought it. He wanted to wear a shirt that says “funny bones” with a glow in the skeleton on it – to a FUNERAL(! ), and the other week we had to rush out to pick up my hubby from a car wreck (everyone was ok but he totaled my beloved Honda Pilot! ), and not till we had been there talking to the police and other drivers for about 10 minutes did I realize Coleman had on his “Speed Demon” Speedy Gonzales t-shirt. AHH! My daughter is pretty hard-headed about fashion, as well, and she never fails to come up with some ridiculous outfit, like cowboy boots and pajamas. What can I say, it makes for fantastic blog material! Happy New Year and I am so happy to hear of your health progress! Yay!